German Foreign Minister Heiko Maas (left) and Russian counterpart Sergei Lavrov shake hands during a joint press conference following their meeting at the Reception House of Russia’s Foreign Ministry. 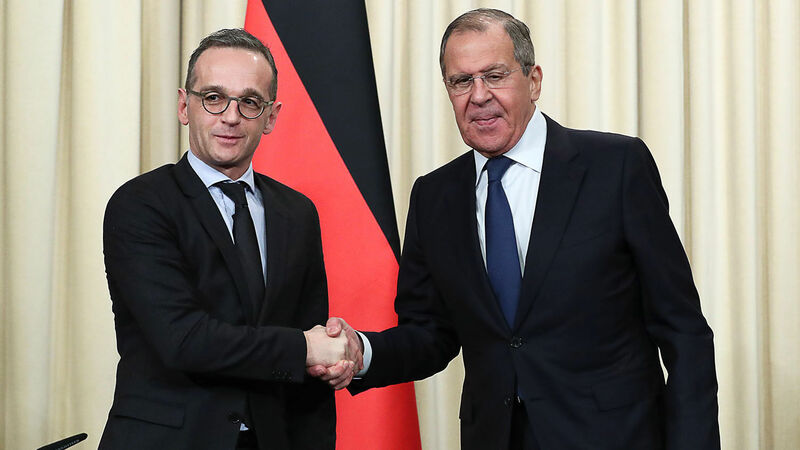 German Foreign Minister Heiko Maas visited his Russian counterpart, Sergei Lavrov, in Moscow on January 18 to discuss, among other things, a new proposal to ensure unimpeded shipping through the Kerch Strait and Azov Sea. After the meeting, Maas flew to Ukraine to inform its leaders of the negotiations. The exclusive discussions between Germany and Russia, excluding Ukraine, reveal the close ties developing between these two powers. The negotiations are a direct result of Russia’s November 25 aggression against Ukrainian vessels in the Kerch Strait. Since that time, Russia has retained a strong hand over movement through the strait and the connected Azov Sea, showing its dominance in the region. While many nations fear this increasingly assertive power, Germany has emerged as the prominent negotiator in deescalating tensions and ensuring safe passage through these waters. The Kerch Strait is located between southwestern Russia and the Crimean Peninsula, which Russia forcibly annexed from Ukraine in 2014. Last May, Russia completed construction of a 12-mile-long bridge across the Kerch Strait, connecting Crimea to mainland Russia. The Kerch Strait is a key transport route from the Azov Sea to its north, through to the Black Sea, and into the Mediterranean Sea. The day after Poltorak made this statement, Maas was discussing the issue in Russia, unbeknownst to Ukraine. And as often happens when it comes to Russia, Germany was acting outside the purview of the European Union. During the negotiations, Maas presented a new proposal that includes changes to several of the points that Russian President Vladimir Putin rejected from the initial proposal presented by German Chancellor Angela Merkel in December. Germany conceded four key points to Russia. While no final proposal has been agreed upon yet, it appears that Russia is coming out on top again. By accepting these terms, Germany is allowing Russia to leverage its control, set the rules, and “have those rules de facto accepted by third parties,” Eurasia Daily Monitor reported. All of these dealings are critical to watch in light of increased cooperation between Germany and Russia. Last year, Trumpet editor in chief Gerald Flurry highlighted the German-Russian Nord Stream 2 pipeline deal. Nord Stream 2 binds Russia and Germany together in a way that undermines nato. In fact, though Russia and Germany will not say so, this pipeline project is clearly intended to wreck nato. Why would these nations want to do that? Well, it is easy to see why Russia would. Russian President Vladimir Putin views nato as a force that restricts Russia’s rise and slows down his quest to rebuild the old Soviet Empire. He has made no secret of his loathing for this U.S.-led organization. So his reason for wanting to unravel it is plain. What is not as obvious is the fact that Germany also wants to eliminate nato. Germany and Russia have a long history of working together, as we chronicled in our article “The Vicious Cycle: German-Russian Relations.” The two have a history of going from best friends to worst enemies at whiplash speed. After working together to build each other up in a mutually beneficial friendship, they rapidly switch sides and use their power against each other to attain their own goals. Their long history has shown this multiple times. During World War i, Germany and Russia were enemies. Germany won a comprehensive victory in the East, which left Russia in ruins. Germany then lost the war in utter defeat to the Allies. After the war, while everyone assumed the two were mortal enemies, they began working together under secret clauses in the 1922 Treaty of Rapallo. These clauses meant that together they built each other up to the point where they could start World War ii. They began the war as allies under a “nonaggression” pact, but Adolf Hitler broke it in 1941 when he invaded Russia, to the shock of Russian leader Joseph Stalin. The warfare between the Germans and Russians on the Eastern Front was especially savage. Many elite Germans feel their nation has now gotten all it can from the U.S. and they are ready to move on. Some powerful Germans today are thinking more and more about the Holy Roman Empire, and they want modern Germany to assume more power of its own in the spirit of that empire. They want to establish Europe as a mighty, German-led superpower. These Germans know that nato is an obstacle to their goal. Back when nato was first founded, its first secretary general, Hastings Ismay, explained its main purpose: “Keep the Russians out, the Americans in, and the Germans down.” The notion of keeping “the Germans down” directly contradicts the imperialistic ambitions that are growing more intense among many elite Germans today. Germany and Russia’s negotiation of the Kerch Strait deal is another manifestation of this friendship. Germany did nothing to help Ukraine, which was about to become a member of the European Union! Does that make any sense? There are many indications that this is all leading to another pact between Germany and Russia. What are Germany and Russia doing secretly behind the scenes? What kind of deal is Russia and Germany working on now through these Kerch Strait negotiations? Why is Germany helping Russia gain control of this key waterway? The fact that it is Germany pushing these negotiations with Russia demonstrates the possible beginning of “another pact between Germany and Russia.” Combine this with the Nord Stream 2 project and you begin to see a strong friendship building between these two powers. But, again, how does this always end? Russia and Germany always go from best friends to worst enemies at breakneck speed. This friendship appears to be blossoming now, with each side mutually benefiting, but Bible prophecy and history tell us that these two nations will once again turn on each other. Germany and Russia may be working together for now to build the seventh head of the Holy Roman Empire and to restore the glory of the Soviet Union, but once they have used each other for their own purposes, they will turn against each other. This is the battle that is referred to in Daniel 11:44. If you follow the chronology of end-time Bible prophecy, you’ll note that this battle leads directly to the return of Jesus Christ! This is how significant these events are.